Designed specifically for photographers on the move, this Formatt-Hitech 165mm Firecrest Elia Locardi Signature Edition Travel Filter Kit is an all-in-one kit containing three 165mm-wide neutral density filters along with the 165mm Lucroit Filter Holder and an adapter ring for attaching the holder to the Tokina 16-28mm f/2.8 lens. Additionally, each of the filters include a pouch for protection during travel and an exclusive Elia Locardi 40-page booklet offering inspiration and insight into his photography is also included in the kit. The included 165 x 165mm Firecrest ND 3.0 and 1.2 Filters are solid neutral density filters providing 10 and 4 stop reductions in exposure, respectively. The consistent density creates a darkening of the entire image, allowing you to photograph with a wider aperture or longer shutter speed than normally required. By slowing your exposure time or increasing your aperture, you are able to control depth of field and convey movement more easily. 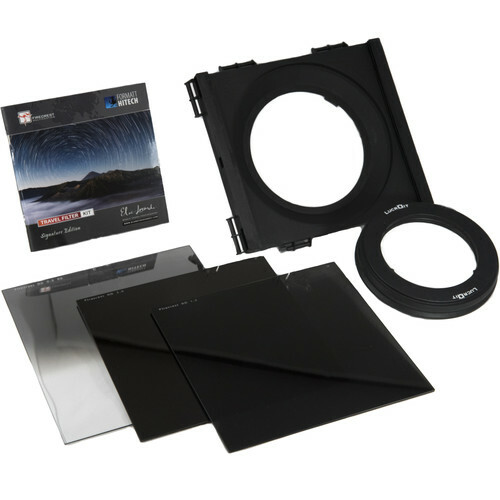 The included 165 x 200mm Firecrest Soft Edge Graduated ND 0.9 Filter helps to darken specific areas of an image, such as bright skies, while allowing for a normal, unaffected exposure in the other regions of the image. The filter is densest at the edge and tapers to clear by the middle, with a soft-edged line of transition between the density and clear areas for working in situations where there is not a distinct line of separation between the bright and dark zones of the image. Neutral density filters do not affect the coloration of the image and the 0.9 density provides a 3 stop reduction in light from entering the lens. The design of these filters have been optimized for use with digital sensors and promote nearly flat attenuation of visible, UV, and infrared light. Due to imaging sensors' greater susceptibility to infrared light, compared to traditional film, color casts can occur when photographing darker subjects that require increased exposure times. These filters provide a high level of neutrality across all three spectra in order to eliminate color casts and ensure cleaner, truer blacks. Applied to the outside of the Schott Superwite glass construction is a 15-layer Firecrest multi-coating, which helps to minimize reflections and flare in order maintain truer colors and contrast. The multi-coating is also scratch-resistant and hydrophobic to benefit the overall durability of the filters. Additionally, these filters are 0.08" / 2mm-thick, making them compatible with the included Lucroit 165mm Filter Holder. The included 165mm Lucroit Wide-Angle Filter Holder accepts up to two filters at once and is specifically designed for use with wide-angle lenses lacking front filter threads. It attaches to the lens through the use of the included Tokina 16-28mm f/2.8 Adapter Ring. Besides the filters and holder included in the kit, a 40-page booklet of Elia Locardi's work is also included for inspiration and a closer look at how he utilizes this system of filters for his own photography.